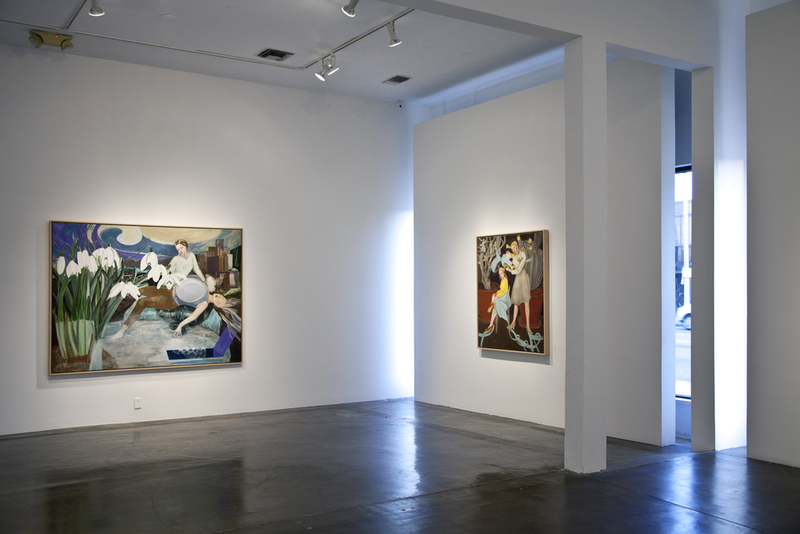 The Michael Kohn Gallery is pleased to present its first solo show with German artist, Rosa Loy. This body of work will be comprised of new paintings as well as a careful selection of older work that was recently on view in a joint exhibition with Neo Rauch at the Essl Museum in Austria. Working within an art movement in contemporary German painting referred to loosely as the New Leipzig School, Rosa Loy’s aesthetic relates to the post-reunification climate of modern Germany. In Rosa’s figurative paintings, a twinge of Socio-Realism is mixed with Pop tendencies, whimsical color choices and dreamy narratives to create a unique aesthetic landscape that often centers on the role of women in society. Unlike other (primarily male) artists working within the New Leipzig School style, Rosa’s narratives opt not to simply reflect the disillusionment of uncertain political times. On the contrary, the female characters in her paintings often engage euphorically with their stark surroundings. Exploring deeply personal themes, these large-scale paintings maintain a sense of intimacy and purpose as the figures interact within an increasingly complicated world. Rosa Loy has had important solo exhibitions at the Städtische Museen Zwickau, Zwickau, Germany; Kunstverein Elsterpark/Leipzig, Leipzig, Germany; VEAG Förderpreis für Kunst, Leipzig, Germany; and Kunstverein der Stadt Backnang, Backnang, Germany.